A late Conor McAliskey free secured Tyrone the early season bragging rights after an absorbing McKenna Cup victory over 14-man Derry at Owenbeg on Sunday. A controversial second yellow card for Oak Leaf full forward Emmett McGuckin proved decisive in a game in which was in the balance right until the final whistle. McGuckin was already on a yellow card for a first half clash with Tyrone full back Padraig Hampsey when he was dragged to the floor by half-time substitute Cathal McCarron only seven minutes after the restart. Despite appearing to signal his innocence by holding his hands in the air as he lay on the floor, Down referee punished both players with a yellow card and McGuckin was off. Tyrone took advantage of the extra man to control the remainder of the game but Derry frustrations were only compounded when McCarron later dragged Mark Lynch down to concede a second penalty of the game and incredibly escape a second booking. Both sides made changes from their opening Section A ties and for both Damian Barton and Mickey Harte there were plenty of positives to take. Yet, the real mystery concerning the first half was how Tyrone managed to end the first 35 minutes only two points adrift after a very disjointed opening 25 minutes in which Derry threatened to run away with the game. The Red Hand cause wasn’t helped by a needless black card for Justin McMahon after 16 minutes following his sustain complaints over a free awarded when Benny Heron was fouled by Aidan McCrory. McMahon was replaced by Mattie Donnelly and if anything the reshuffle helped Tyrone get a foothold in a game that looked to be going away from them. Barton’s team looked very impressive in the opening stages, Dungiven’s Conor Murphy drifting dangerously between the lines and causing havoc in a Tyrone defence that couldn’t work out who was marking him. Mark Lynch got the scoreboard off and running with an fourth minute free but in contrast Tyrone’s shooting was rushed and wide. Derry’s ability to build from the back with the short kick-out was the catalyst for a number of superb Oak Leaf moves and, for the second week in succession, McGuckin and Ryan Bell were more than a handful in the full forward line. The home cause was helped no end by Heron’s opening goal on 13 minutes. A superb Murphy ball in to Chrissy Bradley was spilled by the Slaughtneil forward but the ball broke perfectly for Heron’s supporting run and the Ballinascreen man slipped a lovely first time finish under Tyrone keeper Michael O’Neill despite the attempts of Padraig Hampsey to clear off the line. Derry continued to dominate with points from Mark Craig, Lynch (free) and Bell building a healthy 1-04 to 0-1 point before Derry hit their second goal from the penalty sport on 22 minutes. Ciaran McFaul’s brilliant low pass into McGucking was broken down but the big Magherafelt forward won the race to the ball just ahead of O’Neill who brought him down. For the second week running, Bell’s sent his emphatic spot kick into the top corner and Derry led by nine. It looked ominous but Tyrone regrouped, McAliskey and Darren McCurry grabbing points before Patrick Quinn’s superb 30th minute shot to the Derry net signalled a real shift in momentum at 2-04 to 1-03 and by the interval they had brought that back to a one point game with further points from McAliskey and Johnny Monroe. The second half began with a lovely Bell point but as soon as McGuckin saw red, Tyrone were in the ascendency. They looked to be heading to a comfortable victory after building a 1-11 to 2-05 lead by the 46th minute but Bell’s second penalty brought Derry right back into the game and the Oak Leaf’s defended superbly. Had McCarron received a second yellow after that award, as the Owenbeg certainly thought he should, an interesting game may have taken a different path but with the extra man , Tyrone always looked to have slightly more in the tank. A fourth Derry goal from the excellent Mark Craig, following up his own initial shot to poke home, had Derry briefly in front but the home side eventually ran out of legs as Tyrone put themselves in pole position to qualify although Damian Barton will have seen more than enough to encourage him as he takes his side forward. Derry: Thomas Mallon; Ryan Ferris, Dermot McBride, Oisin Duffy; Danny Heavron, Chrissy McKaigue, Mark Craig (1-1); Emmet Bradley, Mark Lynch (0-2, 2f); Ciaran McFaul, Christopher Bradley (0-1), Benny Heron (1-0); Emmett McGuckin, Ryan Bell (2-2, 2pen), Conor Murphy. (Subs) Karl McKaigue for O Duffy, 44mins; Enda Lynn for B Heron, 45mins; James Kielt for C Murphy, 52mins; Conor McAtamney for E Bradley, 56mins; Shane Mulgrew for C Bradley, 63mins; Peter Quinn for R Ferris, 65mins. 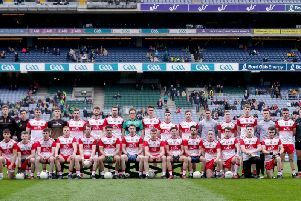 Tyrone: Michael O’Neill; Aidan McCrory, Padraig Hampsey, Jonathan Monroe (0-1); Conor Clarke, Justin McMahon, Niall Sludden (0-1); Padraig McNulty, Richard Donnelly (0-4); David Mulgrew (0-1), Peter Harte (0-1), Kieran McGreary; Darren McCurry (0-1), Conor McAliskey (0-5, 5f), Patrick Quinn (1-0). (Subs) Mark Bradley (0-1, 1f) for C Clarke, H/T; Cathal McCarron for P Hampsey, H/T; Sean Cavangh (0-1) for P Quinn, 41mins; Ronan O’Neill for C K McGreary, 51mins; Cathal McShane for J Monroe, 72mins. Black Card: Justin McMahon replaced by Mattie Donnelly, 17mins.